Fifteen-year-old Aura Ambrose has been hiding a secret. Her mother, a talented artist and art teacher, is slowly being consumed by schizophrenia, and Aura has been her sole caretaker ever since Aura's dad left them. Convinced that "creative" equals crazy, Aura shuns her own artistic talent. But as her mother sinks deeper into the darkness of mental illness, the hunger for a creative outlet draws Aura toward the depths of her imagination. Just as desperation threatens to swallow her whole, Aura discovers that art, love, and family are profoundly linked—and together may offer an escape from her fears. 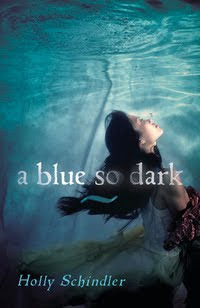 A Blue So Dark was an emotionally grueling book that made it hard for me not to cry every second as I read it. Aura is such a strong girl that would do anything for her mom and she tries to through out her book. Her mom keeps on sinking deeper and deeper into the madness and I couldn't help feeling sorry for both Aura and her mom as they both had to deal with her mother's madness. The plot was an accurate portrait of schizophrenia and it engaged me along the way. It showed that it affects more then the person on medication, but also their family and friends. Schindler's writing was remarkable and I was amazed by her debut. I can't wait to read Playing Hurt, which is Holly's next book. I recommend this book to fans of contemporary young adult fiction that want something fresh, yet intense. It also presented a unique insight into mental illness that I haven't seen much in Young Adult Fiction. Such a fantastic book in every way. Loved it! Oh my god why havent i heard of this book before, your review makes it sound amazing, and that cover woah! !